9-4-02 – I came, I saw, I flew home, I cried. All right, perhaps that last part is overly dramatic; I didn’t cry upon my recent return from Seattle, I merely pouted. For a week. There were around four hundred of us in your city last month, when Seattle was host to the annual Garden Writers of America convention. (That was our group in the seven-coach caravan jamming up your freeways and ferries, filling your trash bins with empty film canisters, and being terribly underdressed as we tromped around Bainbridge Island.) Joining my colleagues once a year for insider tours of the best public and private gardens the host city has to offer is always a hoot. This year’s convention, however, also confirmed an industry rumor I’ve been hearing for some time: Aesthetically, your city is home to the highest level of gardening in America. This is no small feat. There are at least a dozen large cities up and down that other coast with a head start of a century or more. Now they’re battling for second place. Sometime in the last decade (or two, or three? ), Seattle area gardeners have broken away from the rest of the country, and the stubborn Norwegian in me wants to figure out how you’re doing it. It’s not a matter of climate. Sure, Seattle is coastal USDA Zone 8, a benevolent middle ground that affords a broad range of plant material, ample moisture, and the mildest of winters. 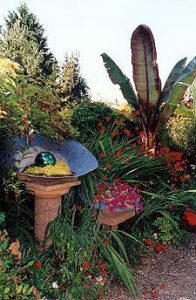 In fact, in Minnesota, we call gardeners practicing the craft anywhere south of Zone 4 cheaters, but a warm climate doesn’t necessarily ensure the creation of magnificent gardens. I find gardens in Florida uniformly dreadful, for instance, all plume and spike, anchored by a gross overuse of tropical grotesqueries best befitting another planet, or, comparably, Disneyworld. Gardens in the Midwest have their moments, though we tend to place too much emphasis on flowers while neglecting shrubs and small trees, with the exception of dogwoods and Arborvitae, which can only get you so far. That and our insistence that garden sculpture need go no further than a few well-placed antique farm implements. Next, head down to Southern California and across the Southwest and you see why too much heat can be a bad thing. Besides, once you get anything resembling desert involved, it doesn’t really add up to much, does it? So what is it about Seattle? 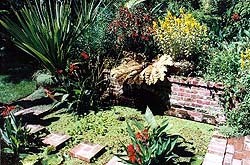 Why did so many of the gardens I visited make the pulse drop and the spirit soar? There’s a residential hillside garden overlooking Elliot Bay that is so full of surprises and clever design ideas you never want to leave; you just hang around, hoping the homeowners will take you in. One of the private gardens in Bainbridge was quite simply the finest homeowner-developed garden I’ve seen, the magic palpable as it raced from path to pond to patio. Ten years ago, Michael Pollon, in his wonderful first book, Second Nature – a gardener’s education, bemoaned the absence of any clear American gardening style: “So far, at least, American garden design (does the phrase evoke anything?) has achieved little of the distinctiveness found in American writing, music, art, or even cooking.” For this lack of originality he blames our reluctance – cowardliness, really – to shake free from the design dictums so heartily established by Oriental and European cultures (primarily the English). It’s one of the few instances one can think of where Americans still give a toss about what another culture has thought and prescribed. 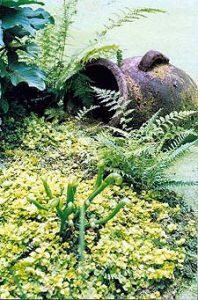 Cheerio and Sayonara – The best Seattle gardeners and garden designers have clearly broken the shackles imposed by our English ancestors, in addition to shrugging off most remnants of the great Japanese Garden Scare of the early 1990s. I toured no cottage gardens (thank you), no formal perennial flower borders, no stark, sandy, pretentious Buddha beds, or any landscape designed for design’s sake. 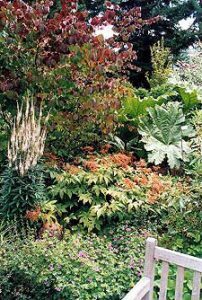 When it came to plant placement, like good acting, one didn’t see the work; what I saw was the natural beauty, botany, and topography of the Pacific Northwest, tastefully gussied up with non-native plants that looked as if they belonged. 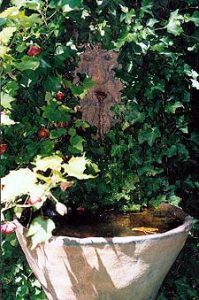 Shrubs, Glorious Shrubs – You can’t hold interest without them. 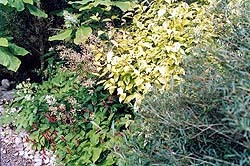 Across much of the Midwest, shrubs are delegated to the back of the bed, if not ripped out altogether to create more room for flowers. 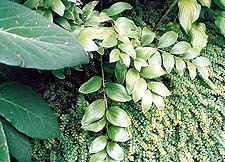 In Seattle, shrubs (and small trees) are given their full due, and appear at the rear, in the middle, and smack at the front of the garden bed. It’s About Leaves – Good gardeners learn to place and coordinate plants based on the size, shape, and color of the leaves. Color of bloom, while important, is secondary, because bloom comes and goes, while a plant’s shape and foliage remains all season. 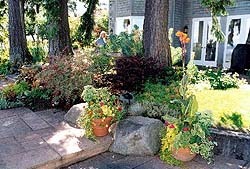 So the foliage needs to accent, complement, and, most important, contrast with the foliage of surrounding plants. Transfer the beauty from plant to plant, never let it drop, and a garden fills with magic. All good gardens around the country are based on this concept, but never have I seen such a broad understanding of this as in the gardens of Seattle. Art Attack – How much art and artful accessories should there be in a garden? Plenty, I’ve decided, upon my return. Seattle gardeners espouse a resolute conviction that a garden exists to entertain. Never have I seen such a preponderance of whimsical sculpture, fountains, columns, benches, fences, walls, ruins, shacks and shanties (not to mention stone, glass, wood, and wire gewgaws) as in Seattle, and I loved it. There’s an age-old question that has always haunted gardening: should a garden be an attempt to mimic nature, or have our way with it? Have your way with it, Seattle, have your way. For too long, American garden design has been crippled by inhibitions and riddled with precedent. 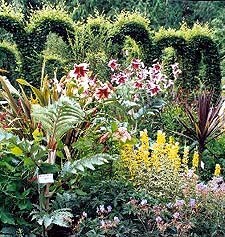 The joyful originality of Seattle’s gardens is a wonder to behold, and I cannot wait to return.